Product prices and availability are accurate as of 2019-04-19 10:17:24 EDT and are subject to change. Any price and availability information displayed on http://www.amazon.com/ at the time of purchase will apply to the purchase of this product. 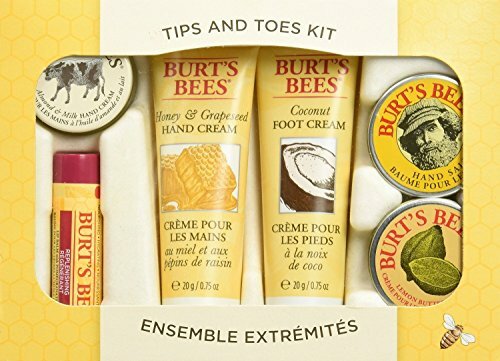 Pamper the hard-working hands and feet of someone special with the Burtâ€TMs Bees Tips and Toes Gift Set. This gift pack includes an amazing natural assortment of 6 Burtâ€TMs Bees favorites for fingers and toes, in trial size portions. Almond Milk Beeswax Hand Cream, Thoroughly Therapeutic Honey and Grapeseed Oil Hand Cream and Hand Salve lovingly moisturize dry hands, while Lemon Butter Cuticle Cream nourishes and hydrates nails and cuticles. Feet also get babied with rich Coconut Foot Cream. Finally, Replenishing Lip Balm with Pomegranate Oil soothes and softens dry lips. This beauty kit provides serious softening and hydrating for dry skin. Give the gift of natural, with Burtâ€TMs Bees.